Working out is exactly as hard as it sounds. It even has the word “work” in there! That’s why it’s so important to treat yourself every now and then for all the hard work and effort that you put into your workouts! A lot of people like to have “cheat meals” or “treats” where they indulge in a deliciously, sinfully unhealthy food like fried chicken, full fat ice cream and poutine. I’m definitely not against that! Poutine is especially delicious with some bacon in it, so I’m totally guilty of indulging myself more often than most. But, at the same time, I’m usually the first to reach for the plate of veggies at dinner. So instead of indulging in food, I like to pamper myself with some spa activities like manicures! 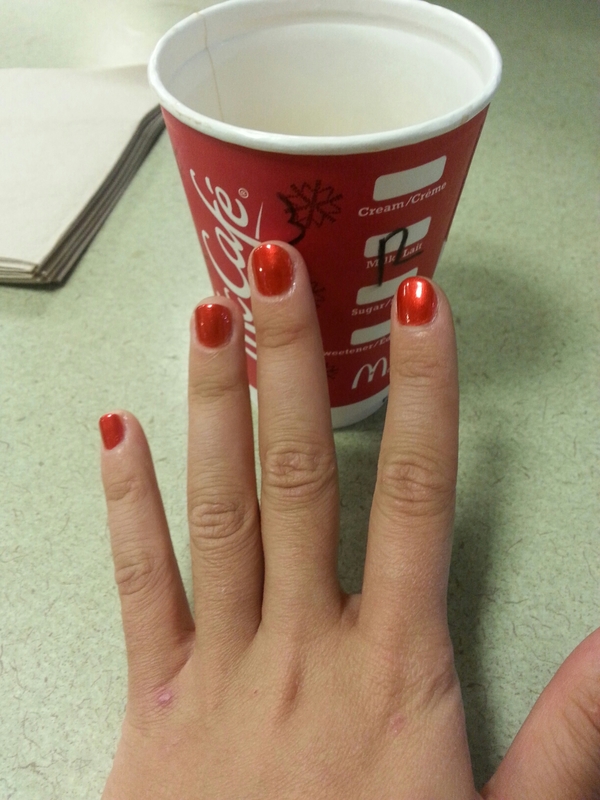 I love sparkly red nails and they still look amazing when they’re as short as mine! But, I was also curious to see how well (or how badly) a short, well done manicure would hold up against rock climbing. I also got a pedicure, which does absolute wonders for refreshing tired running and climbing feet! If you’ve ever tried buying your own rock climbing shoes or talked to someone who’s bought rock climbing shoes, then you’ll know that certain materials that manufacturers use call for very, VERY snug fits. Mine are made of leather, so I had to go about a half size down when I bought them to make sure that they’d be snug against my foot after wearing them in. Even though my shoes are nicely worn in, my toes still get squished against the edges and I figured it’d be a good test of how well a pedicure would hold up as well! As I mentioned in this week’s fitness update, I spent quite a bit of time focusing on challenging my current skills in rock climbing. During all the 5.9s I was tackling, I was concentrating a lot on my hand and feet positions to scale up the routes in a more efficient way. That also means that I really put my mani-pedi through a lot! My hands were completely covered in chalk and my feet were so gross afterwards. But, how did the mani-pedi hold up? My nails were surprisingly still in good condition! My left hand was barely affected but my right hand suffered a casualty on my pinky. I knew exactly when it happened because a hold I was reaching for was a lot closer to the wall than I thought! My big toes were a little smudged at the tip, so that’s probably a good sign that my shoes are super snug (but not painful!) against my forefoot. In this case, that’s a very good thing! Other than that, the pedicure was almost untouched. One other thing I noticed was that my skin was pretty much unharmed. In fact, the mani-pedi procedures scraped away a lot of dead skin and rejuvenated my fingers for a better tactile awareness! Verdict – Short manicures and pedicures are fine for rock climbing, especially to get rid of built up dead skin. But, I’ll probably get a mani-pedi the day before I go climbing to really make sure the polish doesn’t get as damaged! How do you treat yourself to a good string of workouts? Do you like to do “refereshers” like spas or massages? Enter your email address to follow Cafe Lilium and receive notifications of new posts by email.